Here is my take on the challenge. The quote reads "When you realize how perfect everything is you will tilt your head back and laugh at the sky." Buddha. 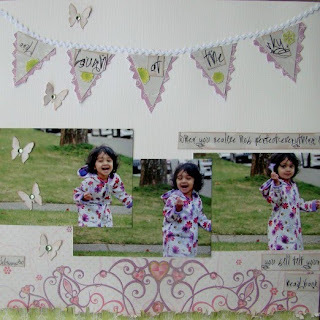 Speaking of Spring, there is a new contest on over at Scraptivity. Its called Spring Fling and there will be a new challenge every 10 days. The prize will be a guest designer spot for 2 months. Its a great way to be inspired and challenged and enjoy being creative. Awh beautiful page! Love the soft colors, so pretty and springy(my own word). lol Sarah! Isn't it awesome when you see them running around just having fun. Very pretty page! Love the banner! I've never heard that quote before - I love it!